Of all the places that I visited in South Korea, there was nowhere that I returned to more than Seoul’s Gyeongbokgung Palace. As the city’s only “must see” tourist destination, I returned five times, taking various family and friends to visit the ancient palace. While not as majestic or captivating as the Forbidden City in Beijing, China, Gyeongbokgung, which means “Palace Greatly Blessed by Heaven”, is still one of the best places in the country to discover what life was like in Imperial Korea. Originally built in 1394 by the King Taejo, the founder of the Joseon Dynasty, the palace was the center of ancient Seoul. However, during the Japanese invasion of 1592, the palace was burned to the ground. The charred ruins of the palace were left until 1867 when Gyeongbokgung was rebuilt and expanded. With over 330 buildings inside the palace walls, Gyeongbokgung housed nearly every government office within the city in the late 19th century. Unfortunately, it was the Japanese who again destroyed the palace in 1912, destroying nearly every building between 1912 and 1915 because they represented Korean independence. On the palace grounds, they built the Japanese Consulate and a zoo. Heungnyemun, the inner gate of Gyeongbokgung Palace in Seoul. Fast forward to 1990, when the Korean government made the decision to rebuild Gyeongbokgung to help showcase Korea’s fantastic history. Since then, many of the buildings have been restored, including the throne rooms and the central gates. Today, Gyeongbokgung is a fantastic place to visit, and strolling through the grounds is a favorite activity for many locals. 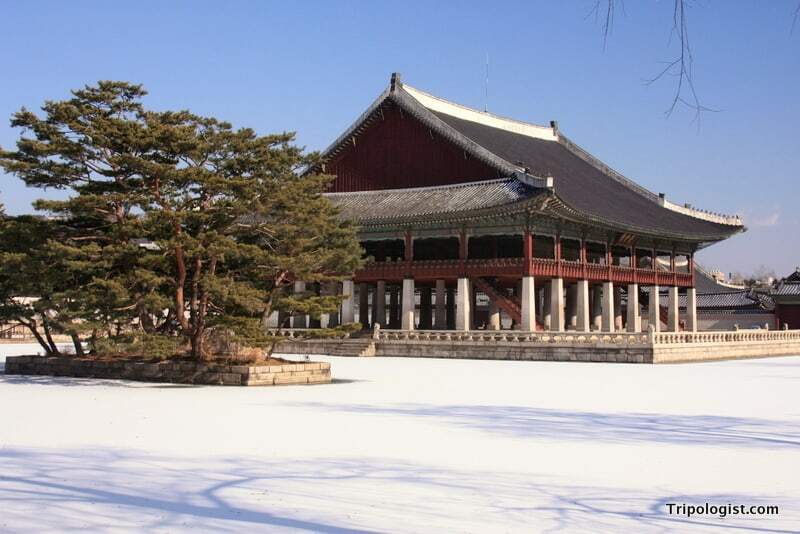 In fact, the palace was voted as one of the most scenic destinations in Seoul in a 2011 survey. 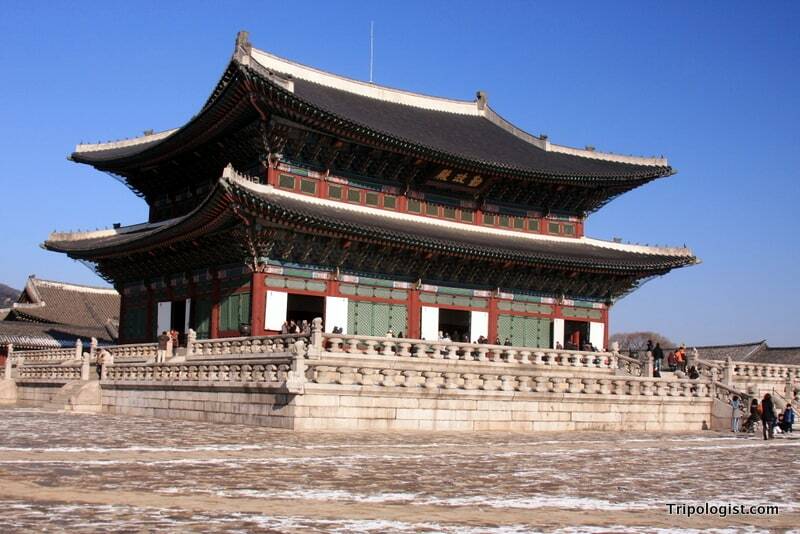 The entrance to Gyeongbokgung Palace is through Gwanghwamun Gate, located in the center of downtown Seoul. 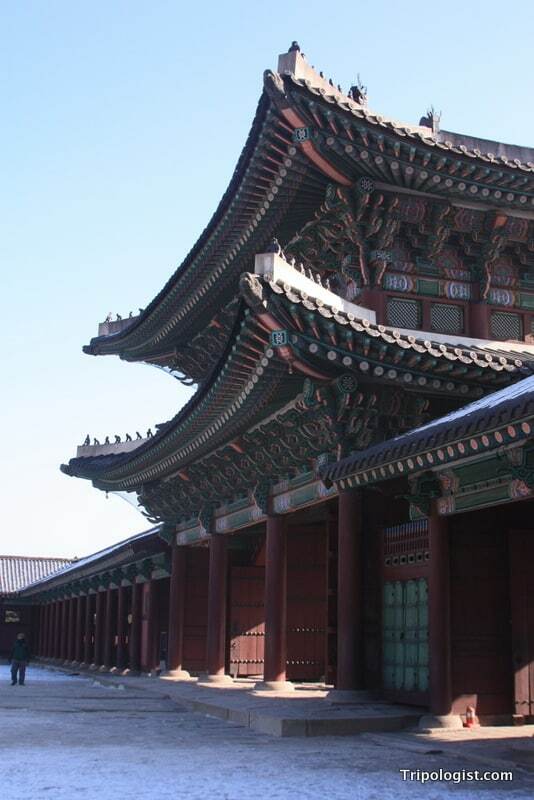 After purchasing your ticket, you proceed into the main courtyards, where you’ll encounter the majestic Geunjeongjeon, or throne hall, where the King of Korea greeted dignitaries. Typically crowded with tourists in the 21st century, the courtyard in front of Geunjeongjeon was historically full of high-ranking officials and soldiers. To the left of Geunjeongjeon is Gyeonghoeru Pavilion. Situated in the middle of an artificial lake, Gyeonghoeru is a wooden structure sitting on stone pillars. Built in 1867, Gyeonghoeru is one of the few buildings to remain intact during the Japanese occupation and the Korean War and was the location of palace feasts and prayers for rain. A picture in front of Gyeonghoeru Pavilion is the classic photo from Gyeongbokgung, and you’ll see many locals and tourists alike getting their picture taken along the lake’s edge. Gyeonghoeru Pavilion, one of the most beautiful buildings in Seoul. Another place worth checking out is Hyangwonjeong. Sitting in the middle of a small pond, Hyangwonjeong Pavilion is easily one of the most photogenic buildings in all of Korea. Backed by Bugaksan, the tallest mountain in Seoul (and the location of a great hike along Seoul’s city wall), Hyangwonjeong is a hexagonal-shaped, two-tiered pavilion. Hyangwonjeong was the location of the most shocking incidents in Gyeongbokgung history, when Queen Myeongseong was murdered and burned by Japanese assassins in 1895. Today, however, the pavilion is one of the most peaceful and beautiful spots in Gyeongbokgung. While you’re at the palace, make sure that you spend some time in the fabulous National Palace Museum and the National Folk Museum, both located in the palace grounds. It is also worth checking out the colorful changing of the guard, which occurs every hour between 10am an 5pm. Gyeongbokgung is located in the center of downtown Seoul and is fairly easy to get to. The closest subway station is Gyeongbokgung Station on line 3, but you can also access the station by getting off at Gwanghwamun Station on line 5. The palace costs 3,000 Won ($2.75), which includes a free English language guided tour at 11am, 1:30pm, and 3:30pm. It is open Wednesday to Monday. I will be accompanying my students on a field trip to Seoul in February, and this is (of course) one of our stops. Before we go, I will use this article in class to allow them to understand the importance of this Korean beauty, along with the history of Korea. Thanks for posting! Glad you enjoyed the article, and I hope it helps your class.